Hello Amsterdam!! Weird Healing is screening at KLIK! Animation Festival 2014 in the Midnight Madness program. BLESS was the last animation of ours to screen in the festival so it has been a while - and we are excited to be back! The festival runs from November 4 - 9 at the Dutch film institute EYE in Amsterdam. On August 23rd (may already be under way!) our good friends at Liberté from Hita are screening at the cross-cultural festival, Good Neighbors Jamboree, in Kagoshima. They will presenting a screening program in collaboration with Petit Cinema from Kagoshima. Liberté will be screening a film program on Jacques Tati and will show a selection of shorts beforehand. Among those shorts is Overture's own, Halfway and our newest short short, Weird Healing! Most exciting for us though, is that among the goods being sold by the independent theater will be our Weird Healing zine which we have as yet only handed out as gifts! The zine will come with a postcard and set of stickers as well as a secret link to watch the animation online before it becomes public. In addition to this our other good friends, dublab.jp, will also be at the festival playing music! If you are down around that way the whole festival sounds great, so take a look! Last night (8/13) we had the opportunity to appear on dublab.jp’s weekly radio program. We talked a bit about Overture, what we do and some upcoming projects. Our theme was Midsummer Night Picnic and tried to create a flow of music that would properly draw the listener in to this atmosphere. The live recording from last night, which includes the mix and us talking over it, is available on dublab.jp’s Mixlr account. We’ve also uploaded a version without the talking should you just be interested in listening to the music. You can take a listen below! We've been added to the roster on the Foghorn website! Foghorn is a management company in Japan for filmmakers and other artists. It is small but boasts some great artists, currently managing animator Hirano Ryo and in the past Sputniko. This coming Wednesday (8/13) we're going to be on dublab.jp's weekly live radio program at café Malmo in Nakameguro. We'll be playing music and talking and probably including some visual element to accompany. It should be weird and interesting! This coming September (9/6/14 - 9/28/14), we will be taking part in the Taketa Art Culture, an art festival spanning the entire town of Taketa, Oita Prefecture's own hidden valley. Taketa is a fascinating place, surrounded by tall mountains and accessible only through tunnels. From end to end, the town can be traversed in a day which makes it perfect for the various exhibits, events and workshops that will take place over the course of the festival. Overture is one of three non-local artists selected to exhibit during the festival. We have been presented with a beautiful old house to use as we like and we intend to not waste any space! While we will show some older work and have some of our animations available for viewing our focus will be on the artwork for the popup book/album Hideaki Takahashi produced. More on the festival later! This past Monday we were able to visit Taketa and learn about the town and the festival and the space we will be in. It was a strange and magical experience and we look forward to visiting again some day. Please enjoy some photos from this small journey. Checking out the old house we'll be showing in with another guest artist, Saruyama-san and of the event organizers (and artist), Kato-san. Second floor of the house we'll be using. Aya peaking in the mail slot of the old house we'll be showing in. We woke up super early after our first day and poked around all the little spots of the town. Another shot of the house we're showing in (on the left). We ended our trip by going up to Oka Joshi (Oka castle ruins), the ruins of a once enormous mountaintop castle overlooking Taketa. Even without buildings, the space is amazing. This past Friday (8/1) we spent a wonderful afternoon at the independent theater, Liberté in Hita, Japan. It was our third time doing a workshop and a screening at Liberté, once in 2010 through flau with the band Sheeprint, and once in 2012 with our friend Jordan Kim. We have watched the theater's rise from a haven of culture in the middle of Kyushuu's quiet countryside to a vital cultural centerpiece of the area, bringing in interesting films and guests from around Japan - and the world. This time we did a little workshop with children and adults making collaborative Exquisite Corpse drawings, as we became re-hooked on the exercise a couple weeks ago at Snow Farm, and followed it with a screening of some of our animations. The Exquisite Corpse drawing was so popular that everyone got together after the screening to make one last set of drawings. As always, it was a very positive experience and we had some great discussions with Shigeki Hara, the theater's owner. A selection of some of the Exquisite Corpse drawings the participants made. Some participants deep in the thralls of their own work. Overture with Shigeki Hara, Liberte's owner and a huge cultural supporter in the area. One example of Hara-san's impact on the region: We visited a fairly traditional champon restaurant and ordered one of their popular new bento sets. The bento is laid out beautifully (as shown) and wrapped in a printed paper artfully depicting the logging business, a cornerstone of the local economy. Hara-san did not put the bento set together or design the wrapping, but the owner came out while we were eating and praised Hara-san for all the positive work he has done in the region. Hita has popped up in a number of popular magazines in the past few years and Hara-san is usually credited in the articles for showing the journalist around or providing/pushing the information. Without his relentless efforts of promotion, projects like the bento set would not be happening in the area. It certainly wasn't even two years ago when we visited. After four years we finally updated our demo reel! Take a look at some highlighted moments from our animations, all set to the music of Liquid Pegasus! Also, be on the lookout for some clips from Weird Healing, our very short short that has yet to go public! For two Saturdays this July (7/5 & 7/19) we were guest artists at Snow Farm's summer arts camp for high school students. 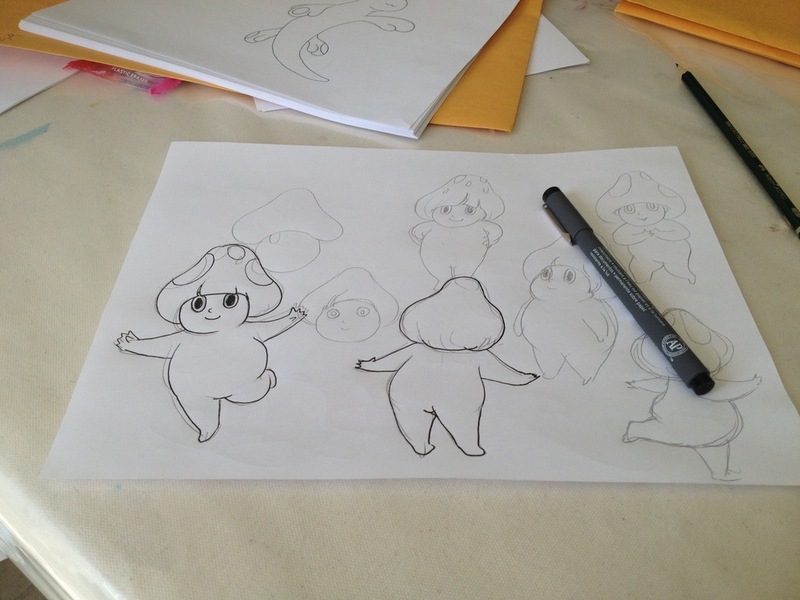 We shared some of our animation work and lead a day-long workshop on hand drawn animation. Both sessions went really well! All of the students are amazing artists and only needed a point in the right direction. Many thanks to the Sara and Corin who assisted us during our workshops and to our good friend Steve Theberge without whom we would not have had this opportunity. Thank you for the recommendation, Steve! Check out his amazing ceramics. Below are some photos Aya managed to snap during the two visits. The evening before each workshop all of the guest artists spoke with the campers and gave a little example of their work. Here we are screening our latest animation, Coast. A small portion of the campus. Our initial gathering table for early exercises and character design. Everyone had their own style and designed a wide variety of characters. 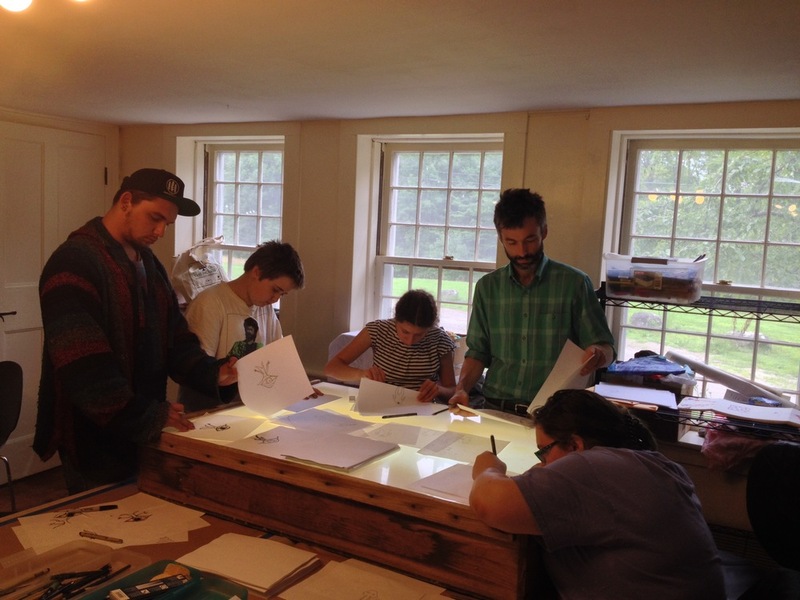 The farm had an enormous light box we turned into the communal animation table. Well... we decided to join the students in doing a bit of design and animation. Checking to make sure everything is running smoothly before class starts on our second workshop. More communal light box use. ...More of our own contributions. Look out for these guys in the future! The food at Snow Farm is amazing. Vegan Reubens, gazpacho, super salad bar, great coffee, and on and on. Eating lunch with good friends Fafnir Admities (textile guest artist!) and Steve Theberge (ceramics artist, staffer at the farm and the reason we had this opportunity! Thanks Steve!). We kicked the mornings off getting into limber drawing and collaboration shape with some Exquisite Corpse exercises. Serious stuff. Maxx from our second session made a colorful eyeball character and walked off with an Overture sticker on his hat! That's the Moon Hare up there! A video with Oh shu, a wonderful musician who contacted us earlier this year, keeping us in mind from two years ago when he live scored Bryum & Kapok in our event, Ritual Exchange, at Super Deluxe, Tokyo. In this new work an old woman confronts the ocean and comes undone. You will see the results. The video accompanies the release of Oh shu's big official album release, Wang, on the label Felicity. It is a new style of music for our world to be paired with and it is a beautiful fit. Weird Healing is screening in this year's Animation Block Party! Last year we were fortunate to have Ludic Chase selected for screening and are very excited to be back for another year. And we certainly plan on attending! Weird Healing is traveling to the festival with Animation Breakdown, the festival that premiered Weird Healing at Cinefamily this past Spring. Animation Block Party runs July 24 - 27 and Weird Healing will screen at BAM Cinematek on the 25th in Program 3. Followed by a party! Details on the festival site. A nice write up about BLESS, our animation with Kira Kira, on this site, FDRMX. Apparently it is a popular video there! Also, be on the lookout for nice animation references throughout the article. More video game related news! We have an illustration in the new issue of Kill Screen, a magazine (and website) focusing on video games. The magazine is truly beautiful and we highly recommend picking it up a copy. There is a great variety of artwork throughout, tied together by the deft art direction of our good friend CJ Dunn. The articles Kill Screen publishes are also very good, the in-depth and thoughtful kind you always hope to read about video games. Our illustration concerns the permeation of virtual worlds throughout human history and the numerous means of access. The accompanying article describes specific examples of virtual reality in different cultures. Weird Healing at Film Leben Festival 2014! Weird Healing is screening in the Film Leben Festival, a short film festival in Ilmenau, Germany running May 22 - 25 2014. It will be screening in the Animation section that Friday (details here) with some really amazing looking films. We are honored and excited to be selected. We recently participated in this ADC Young Guns project: Reanimation. It's a simple side scrolling video game with assets created by 48 different artists. Every time you die (or reach the goal) a new character is spawned in a different artist’s world. Our level features a drop of water crossing a desert landscape to reach a flower. The levels cycle randomly so it may take some time to reach ours (screenshot at the top). It was a fun project to be a part of and has only inflamed our desire to make a proper video game. We are very pleased to present the live scoring TCPPP (Josh Vrysen) performed to our animation, Halfway, on March 21, 2014 at Flying Object in the Sight + Sound II event! Listen with headphones or at high volume to pick up all the layers and subtle detail Josh adds, giving the animation a weight and new dimension. Thanks to Ted Lee for recording and sharing! A new live scoring event! 8:00 PM this Friday (3/21/14) at Flying Object in Hadley, MA. There is even a Facebook Event to find more info. This is a continuation of The Silver Screen and Staged Sound Spectacle we participated in last year at Popcorn Noir with Josef Lincoln performing to Ludic Chase. This time TCPPP (Josh Vrysen) will play to Halfway! We are very excited to find what a fresh sound will reveal! Please join if you can! There are many wonderful filmmakers and musicians participating! Oh, and Josef Lincoln will be live scoring a film by our friend by Sidney Satorsky, so we are especially excited to see and here that!